Refer to your Chevrolet Vehicle Owner's Manual for additional information. Chevrolet Complete Care, our comprehensive owner benefit program, goes above and beyond to ensure you're satisfied with your Chevrolet. Backed by 2 years or 48,000 kilometres of complimentary Lube-Oil-Filter maintenance service,1 3-year / 60,000 km New Vehicle Limited Warranty,2 a 5-year / 160,000 km Powertrain Component Limited Warranty,2 5-years / 160,000 kilometres of Roadside Assistance and Courtesy Transportation2 and more, you can be confident you're getting the most from your investment. 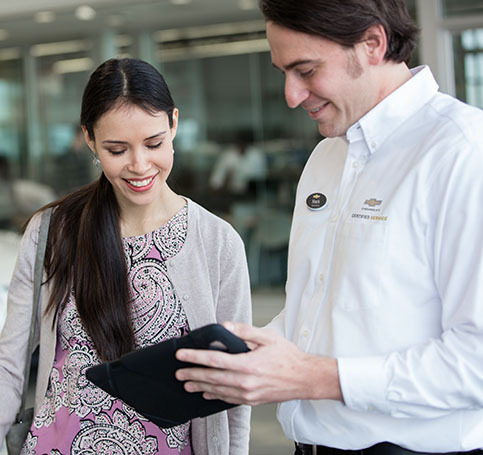 Find out how Chevrolet Complete Care offers greater peace of mind. Additional information about service and maintenance for your vehicle, including your maintenance schedule, can be found in your Owner’s Manual. Regular oil changes can help improve the performance and fuel economy of your Chevrolet car, truck, or Crossover. Thanks to advances in engine technologies, newer models have a much longer range between oil changes. Always refer to your Chevrolet Vehicle Owner’s Manual for oil change intervals for your specific vehicle. Certified Service technicians at your Chevrolet dealer are expertly trained to understand how your vehicle uses its oil and how it monitors oil life. So an oil change from your Certified Service experts not only gives you great service, convenience, and a great price, but you also receive the added value of our expertise on your Chevrolet vehicle. 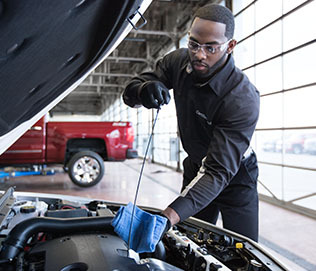 Plus, with Chevrolet Complete Care1 select scheduled maintenance services are covered in the first 2 years or 48,000 kilometres—including oil changes with filter. Certified Service technicians can help you take full advantage of the benefits found in Chevrolet Complete Care so you get the most value from each maintenance visit. So, come see your Chevrolet dealer when it’s time for your next oil change. Choosing the proper grade of oil is a critical step in engine maintenance. 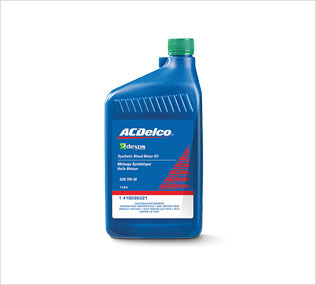 From conventional to full synthetic, your Chevrolet Certified Service experts offer a range of oil types, including ACDelco Conventional Oil and ACDelco dexos1TM Synthetic Blend. Ask the experts which grade of oil you should use for your specific Chevrolet model. You can also check your Owner’s Manual for the correct grade. 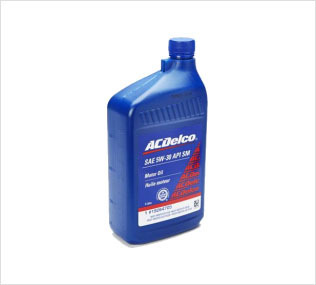 ACDelco Motor Oil only meets pre-2011 GM standards. Dexos1 synthetic blended oil is specifically engineered for Chevrolet, Buick, GMC, and Cadillac vehicles. Most Chevrolet vehicles are equipped with an engine Oil Life Monitoring System. Your Certified Service technician will reset your Oil Life Monitoring System after every oil change. To reset the system yourself, ask your technician how, or consult your Chevrolet vehicle Owner’s Manual if necessary. It’s a good idea to periodically check your oil level. In order to get an accurate reading, the oil must be warm, at normal operating temperature, and the vehicle must be on level ground. Always consult your vehicle Owner’s Manual for the proper procedure to check your oil level. You’ll get a more accurate dipstick reading by following those instructions. When you need new brakes or it’s time for a brake inspection, visit your local Chevrolet dealer, where your Certified Service experts understand your Chevrolet car, truck, or Crossover better than anyone. When maintenance as critical as brake service is required, why go anywhere else?